The 1877 History of Lawrence County, Pennsylvania says of the mid-western Pennsylvania frontier in the late 1700’s: “Wild turkeys were so thick [settlers] could kill them with clubs, and deer were also extremely plenty. Of the latter, John Sprott killed as many as sixty during one autumn hunt” (Durant 61). Sprott and one of our Marshall patriarchs, John (1765-1853) (see Our Marshall Family Tree), were some of the dozen men known as the “Settlers of ’96.” In 1796 this territory was still part of Allegheny County, or Pittsylvania as some called it. 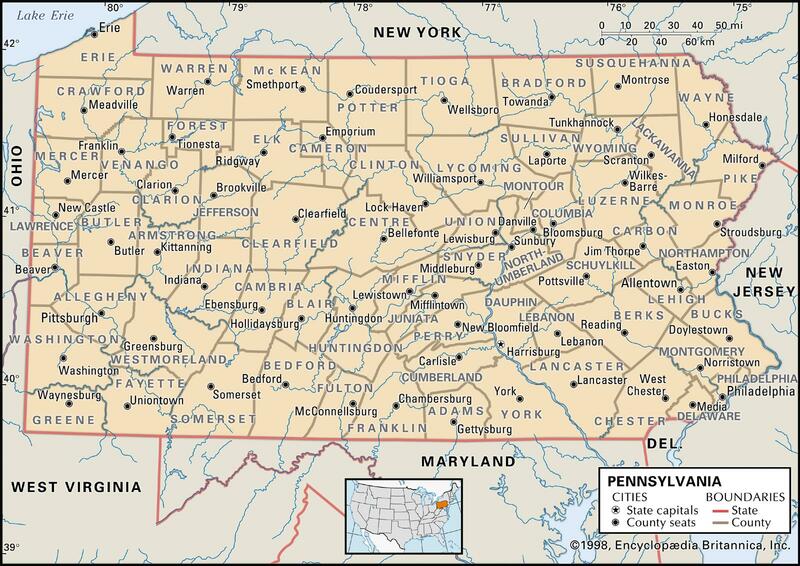 Lawrence County didn’t exist until 1849 when it was formed from parts of Beaver and Mercer Counties. We’ll hear more about those names in a minute, but it’s important to know how a genealogist and writer could locate these ancestors after some 200 years. In an earlier article, “Tapping Into our old Hill & Marshall Families’ Wills,” we recounted the details of Great-great-great grandfather Joseph Marshall’s (1804-1889) last testament, written in 1878, which identifies his residence as Little Beaver Township, Lawrence County, Pennsylvania. A simple request to the search engine Webcrawler revealed several sources that led to some delightful details of our Marshall family in that time and place. We want to share some of those fascinating stories here. More recently, a search of Ancestry.com revealed John and Joseph’s ancestors, whom we’ll also reveal. 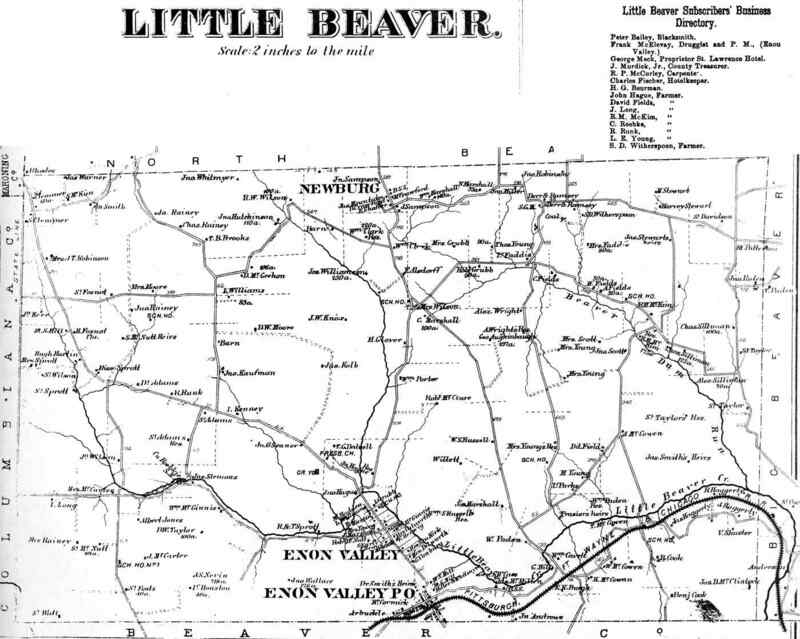 Little Beaver Township is in the southwest corner of Lawrence County and is named for a creek, a tributary of the Beaver River which joins the Ohio River at Beaver Falls as it stretches northwest from Pittsburgh before crossing into the state of Ohio and falling southwest toward the Mississippi. The old Pittsburgh, Fort Wayne and Chicago Railway, completed in 1850, runs along the rivers on its way to Youngstown and eventually Cleveland. The land in those frontier days was acquired through an act of the state legislature for settlement purposes by sale or improvement through the Pennsylvania Population Company. The “Settlers of ’96” had staked claims, cleared land, and built cabins a year earlier. The soil was rich, the trees abundent, and water for power along the Little Beaver extensive, but the men dared not work alone. Durant says, “The greatest pests were the grey wolves, which roamed in packs through the woods, and ever and anon made descents on the sheep folds and pig pens of the settlers. Close watch was kept over the children, and it was also necessary for the men themselves to keep their rifles in order, and always with them” (61). Another tale featured Thomas Smith who was chased by a bear as he hiked through the forest. Smith managed to climb a tree, but apparently not high enough as the bear bit off his big toe. Fortunately, his dog jumped up and grabbed the haunches of the bear thus distracting him until Smith could get down and hobble to safety. Soon two villages sprang up in Little Beaver Township, Newburg to the north and Enon Valley to the south. The name Enon means “Valley of Many Waters.” Our John Marshall, Joseph’s father, was an Ulster Scot originally from Glendermot, County Down, in the eastern part of Northern Ireland, is said to have first located across the Ohio River in Washington County (once part of Virginia) but then moved his family north to claim property just above Enon Valley. In ’96 he had a wife and a son. This son was James, with John, Jr., and our Joseph coming along a few years later. Eventually, the couple had eight children. We believe that Durant’s reference to “a daughter in Mercer County” points to the part of a family that produced Margaret Sarah Marshall (1831-1907) who married our John Dixon Hill (1824-1915), later a Captain for the Union cause in the Civil War, from Leesburg, Mercer Co. A James Marshall settled in the township in 1818, but we don’t know if he was a relative from Ireland. We do believe, however, that the James Hayes Marshall who was drafted for the War of 1812 and served in Erie was the son of John Jr., our Joseph’s brother. One story survives of an Irish woman, Mrs. McGeehan, who burst into her house one day and excitedly shouted to her husband in an Ulster brogue, “Misther McGeehan! Sur Willie hae twa somethings up a tree, and he dinna ken what they are, at all! They keep squattin’ round an’ lookin’ at him! Would ye be afther comin’ to see?” Her husband screamed back, “Why, Woman, they are panthers! They’ll kill him sure as the world!” At this, Mr. McGeehan took his gun and bounded out the door to find young Wille innocently observing the big cats who were crouched and ready to spring. McGeehan put the gun to his shoulder and fired, killing one of the pumas. The other wasted no time, after a blood-curdling scream, high-tailing it into the brush, never to be seen again. Imagine poor Willie as he was scolded over that close call (Durant 63). The Marshalls were no doubt Presbyterians, having come from King James’ Scottish plantation in Northern Ireland. The believers first met in homes from the time of their original settling. Their first permanent church was built of brick in 1834 and appropriately named The Little Beaver Presbyterian. Although that structure no longer stands, the community cemetery organized on the same ground received its first burial as early as 1797. Are any of our Marshalls buried there? We don’t know, except to repeat Durant’s words: “The grave yard has been used for burial purposes ever since, and has been nearly filled up” (63). No internet record is available presently, but we’ll research other sources. The original Enon Valley became known as “Enon Valley – Old Town,” or “Old Enon,” and soon “Enon Valley – New Town” took shape just to the south. Along with the saw and grist mills came general stores, blacksmith and wagon shops, tailor and shoe shops, and even a cabinet shop. A post office was established in 1830, where the stage coach stopped to change horses while offering transportation between Beaver Falls and Cleveland. Before long the St. Lawrence Hotel was constructed, and by 1858 a distillery made the township complete. The first one-room school house in those parts had been built of logs around 1800 and another in 1807. By 1875, there were a total of nine with an enrollment of 321 students. The teachers, who worked for only six months a year back then, allowing plenty of time for the children to help on their farms, shared a total annual salary budget of $1,975.38. When the weather permitted, the schoolmasters and pupils played a game combining base and dodge ball at recess. The runners had to be “patched” or struck with the ball between bases to be out. The boys all wore buckskin pants then, which graphically showed how many hits they had received while running. Apparently, the players who received the fewest “patches” were considerd the best athletes. What became of our early Marshall family? The Beers Atlas of 1872 shows several Marshalls still living in Little Beaver Township, one just north of Enon Valley where the original farm must have been. Another resides east of Newburg on the northern border with Big Beaver Township. As mentioned above, the nearby Mercer County John Dixon Hill family, from which my grandmother Bessie Reed Hill Pearce descended, married into these Marshalls after they spread into that neighboring territory (see Our Marshall Family Tree). Family tradition says that Captain Hill, for his military service, was able to acquire farms for each of his four sons in Adams Township, Butler County, to the south. One son was named Joseph Marshall Hill (1858-1939). He married Alice Virginia Moon (1865-1947), a descendant of Revolutionary War soldier Henry Moon (17? – 1825) of Pine Township, Allegheny County. They were my fraternal great-grandparents. One of Alice’s ancestors, Jane Moon (1791-1865) had married a Samuel Marshall, Sr. (1772-1856), a Scots-Irish farmer also from Pine Township. No doubt, he was one of the many other Marshalls who had also settled the Pine Creek Valley of our Pearce Mill fame (see earlier “Pearce” articles). After the Pearce’s land was taken through eminent domain to form North Park in 1927, several lakes were constructed there, the upper one named for a Marshall family. Today, one of the nearby major thoroughfares north from the City of Pittsburgh, Perrysville Highway, is also known as Marshall Avenue. Future research will no doubt help further categorize most of these namesakes. Most recent research has revealed that our earliest known patriarch at this time was named David Marshall (b. 1715), and he and wife Elizabeth Harkness (b. 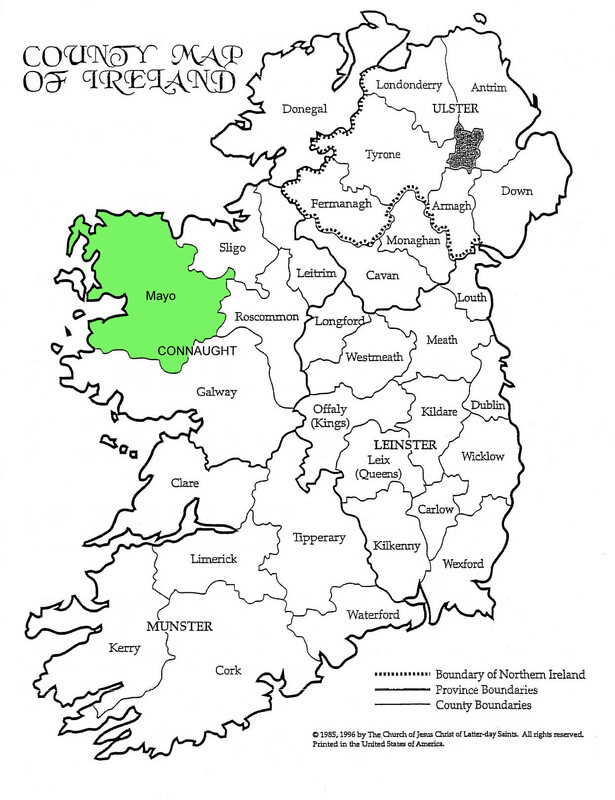 1719) were born and married in a little village named Ballyguin in County Mayo, in the eastern part of Ireland. Today, this town, whose name means “place of someone with a pale face or blonde hair,” is in the Republic of Ireland. Son Patrick, another good Irish name, was also born there, but at some point in time the family moved east. We know that Patrick’s son John, to whom we referred above, was born in County Down, Northern Ireland. John’s wife, Elizabeth Hayes, was also from the North, born in Glencoe, County Antrim. Her family is associated with nearby County Tyrone. Of course, as we said earlier, John and Elizabeth emigrated to America and found their way to the frontier of Western Pennsylvania. In conclusion, a descendant of an Alexander Marshall (1800-1839), who married into my mother’s maternal Campbell clan of what is now Pittsbugh’s Fox Chapel, was the original inspiration for this study and article after he e-mailed an inquiry on our common family to me. We don’t know if and what all the connections are among these various Marshalls of Allegheny, Mercer, and Lawrence Counties presently. We continue to search for links and lineage. But, I do know that my late father Ralph (1917-2002) proposed marriage to my mother Ruth (1917-2005) on an old wooden foot bridge leading to an island in North Park’s Marshall Lake in 1938. Dad always said that if she had said no, he would have let the ring fall between the cracks into the water below. Fortunately, she accepted and the rest, as they say, is history. I also proposed to my wife in that exact same spot one April evening in 1970, just after the park’s curfew. Susan rather hurriedly also said yes. An officer of the law was waiting for us as we returned to land. He was quite forgiving when I explained the circumstances for our transgression. He let us go and wished us the best. These are the stories and narratives that transcend the generations. We hope through the telling that they will all last another 200 years. Adams, D. Christine. Known Descendants of Henry Moon. 2 November 2001. Barbour, Marshall. Family tree of Alexander Marshall and e-mail. 3 November 2009. Durant, S.W., and P.A. History of Lawrence County, Pennsylvania. 1877. 17 November 2009<http://usgwarchives.net/pa/lawrence/1877>. Various Public Member Family Trees & U.S. Censuses. 25 February 2014. Ancestry.com. Thanks for your inquiry. You don’t include any dates or locations and I don’t see any references to William on our tree or in the Introduction. May I refer you to three sources: the History of Beaver & Lawrence Counties, PA; the Marshall forums at ANCESTRY.COM & GENFORUM.COM; and Google names and locations. Good luck, and please let me know what you find out. William Marsall was born in 1750.Yohogania co.Va. ((S.W Pa.)He married Jane Bruce in 1769 in Washington co.Pa.They may have lived in Oldtown Md for a spell before eventualy moving to Nelson Co Ky. I was just wondering if during your research you have ever com across a Samuel Marshall (1858-?) That married a Susan Hiles Hawk (1844-1916) and had children George Washington Marshall (1884-1954), Charles, Pearl, Mazie and Daisy? I was able to find one census 1900 that included these names. The lived in North Union Twp, Precinct 2, Fayette County, PA. Thank you so very much for your time. Any information is welcome as I hit a brick wall. George W was my great grandfather. Hello! Your writings are a great source. I am one of the Moore families also of Enon Valley. Seems a John Marshall went to a Moore reunion in Ill. by train. They I believe were neighbors. This would be 1800-30 and the reunion 1850’s Lasalle,Ill. My mother Is a Moore from Enon. Is the Marshall home off Gilmore rd James? I know there was a Rev. Soldier in the Marshall family. It sits across from David Moore’s. Does anyone know of a Jemima, daughter of Samuel Marshall, who married Capt. Thomas McDonald in 1798 in PA?